Hydrogen peroxide is a good cleaner for dentures, and a product many of us already have in the medicine cabinet. This is a guide about using hydrogen peroxide for cleaning dentures. 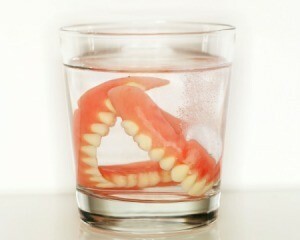 When soaking dentures, do you use neat hydrogen peroxide or diluted? Have you found it may discolor or fade the color of dentures or no? Thanks. Denture tablets cost less per use than using peroxide. Check generic, Walmart. A short time ago I saw a post about using hydrogen peroxide instead of regular denture cleaning tabs. I need to know if you use it full strength? The last response I heard from this post was, "yes" use it full strength.